Growing up I've never really had any problems with my scalp. It was never too oily and never too dry. However around the time I started colouring my hair I noticed some changes in my scalp. After having my colour done it was sensitive and itched quite a lot too. I also found that some days my hair seemed to hurt a little at the roots. This tended to happen when I tied my hair up. Some days it was fine and others I had to wear it down because I couldn't seem to stop the pulling feeling on my hair. 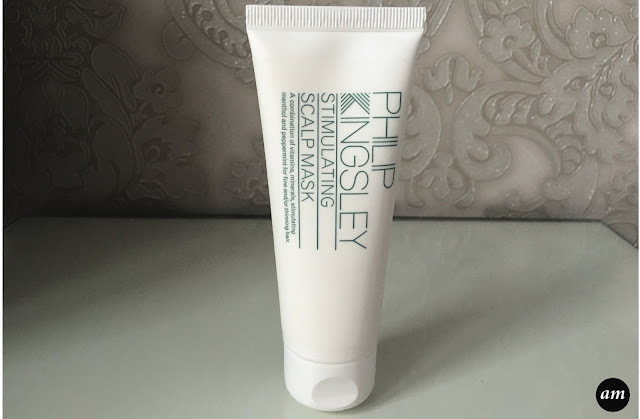 I decided to try the Philip Kinglsey Stimulating Scalp Mask to try to deep clean my scalp to see if it made it better. I've used Philip Kingsley products on both myself and others in the past and I've never had any trouble with them. They are made to be gentle on the scalp, which is why I opted to try this scalp mask first, instead of something more intense like Nioxin. The mask stimulates the scalp which encourages blood circulation while helping to improve the behaviour and texture of your hair. The formula is made with vitamins and minerals to improve your scalp. On the tube of the mask it advised that it could be used alongside the Philip Kingsley Elasticiser. I waited until I was due to put the Elasticiser treatment on my hair and used the scalp mask with it. You are suppose to keep the scalp mask on for 10-20 minutes to experience the full benefits. Once the time is up you are advised to shampoo and condition your hair as normal. After using the scalp mask, my scalp felt instantly clean. It is hard to describe but it felt like it had lifted all the bad off my scalp and left me with a fresh, clean, new scalp. It no longer felt clogged up and it wasn't itchy. I'm going to continue to use the scalp mask every time I use the Elasticiser to make sure that my scalp gets a deep clean to avoid it becoming clogged up with products and colour. I think that the Philip Kingsley Stimulating Scalp Mask is a great product for anyone with a sensitive, itchy scalp. I have defiantly noticed a difference in my scalp and over time I shall see whether it has an effect on my hair.